Defense Secretary James Mattis is the most popular Trump cabinet member with a 20% net favorability rating, according to the latest Morning Consult/Politico survey, with Education Secretary Betsy Devos receiving the highest unfavorable rating. 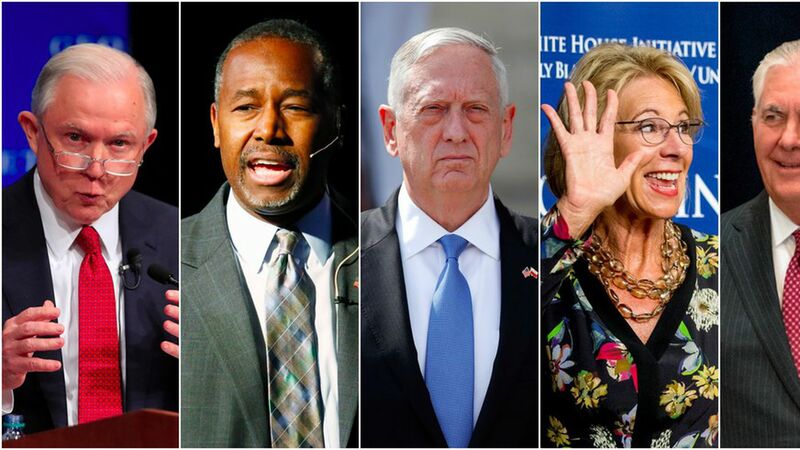 Why it matters: Not a single cabinet member received more than 50% favorability, with Ben Carson receiving the highest favorability score of 42%, however he had more haters than both John Kelly and James Mattis, which put him in third place for net favorability. HUD Secretary Ben Carson with +9% net, and 42% favorability. Secretary of Veterans Affairs David Shulkin with net +9% and 28% favorability. Secretary of State Rex Tillerson with net +7% and 35% favorability. Secretary of Agriculture Sonny Perdue with +4% net and 24% favorability. The least popular cabinet member was Education Secretary Betsy Devos who had a net -12% favorability, with 40% viewing her unfavorably. She was followed by Attorney General Jeff Sessions (34%), Energy Secretary Rick Perry (30%) and then Treasury Secretary Steven Mnuchin (26%). The "net favorability" score is found by subtracting the percentage of respondents who view the cabinet member unfavorably from the percentage of those who viewed them favorably.